To start with, a very short history of radio astronomy would be helpful. Radio astronomy was born in the early 1930s when Karl Jansky, working for Bell Laboratories, was trying to determine the origin of a source of noise that was showing up in receivers operating in the 20 MHz region of the radio spectrum. Jansky built a steerable antenna and began searching for the source of the noise by taking directional measurements. To his surprise, he discovered that this noise was from extraterrestrial sources. Jansky, enthused by his discovery, published his work, however the majority of astronomers at the time were decidedly underwhelmed by this discovery and for the most part dismissed it as either irrelevant or simply curious. There were a few inventive individuals who saw the potential for this noise from space. One of them, Grote Reber, an electronics engineer and avid radio armature, had reviewed Jansky's original discovery and speculated that the signals were of thermal origin (caused by very hot objects), and as such they should be easier to detect at higher frequencies. Since Jansky's original work was done at 20 MHz (about 15 metre wavelength) and a beam width of about 25 degrees, Reber wanted to narrow the effective beam width to obtain finer detail. Reber reasoned that he should build his first receiver and antenna to operate at 3000 MHz (10cm wavelength) an extraordinary frequency at that time. With his own resources and enthusiasm, Reber built the first parabolic reflector radio telescope. Since this was deemed a private 'extracurricular' activity, Reber received no sponsorship or support. Besides being the first of its kind, it was also a huge structure. Basically built by a single individual, it was 9.5 metres (31 feet or 3 stories) in diameter. The term 'Radio Telescope' had not been coined at the time, however Reber gets the credit for building the first one. Although he did not prove his original hypothesis, his work went on to detail the first radio map of the galactic plane and large portions of the sky. Reber published his work "Cosmic Static" in the late 1930's. It was the search for static or noise that led to the development of the radio telescope, and it is essentially noise from the universe that the radio telescope detects. Buried in this roiling confusion is information that is specific in nature to astronomical objects and phenomena. This noise bears witness to the physical characteristics of the universe. The information is presented as a mixture of signal properties such as frequency, phase, amplitude and in some cases repetitive patterns. Also present is information that can be mathematically assembled into 'radio pictures' of these cosmic objects. Some signals arrive from finely defined sources that can be, by and large, considered as point sources (quasars and pulsars for example). Other sources cover vast areas and can be thought of as wide field objects. These are clouds of dust and gas, star 'nurseries', galaxies and a plethora of other interesting goodies. To obtain information from these sources, the radio telescope must receive not only specific information but also all the 'noise' from these objects and their surroundings then reject what isn't wanted and record the results. Radio frequency signals of extraterrestrial origin are extremely weak. As an example, if all the signal energy ever received from all the radio telescopes ever built (viewing objects other than the sun) were combined, there would not be enough total energy to melt a single snowflake. The radio telescope must first concentrate signals gathered over a wide area and focus them into a small area. This is the same principle on which the reflecting optical telescope operates. The term "radio optics" refers to this similarity. Since the term 'light' really means electromagnetic radiation, all the same basic equations, theories and principles are applicable to radio, infrared or visible light. The big difference is that optical telescopes operate at extremely high frequencies and microscopic wavelengths, while their cousins the radio telescopes work at lower frequencies and longer wavelengths. Resolution, which can also be expressed as beam width, is a function of the wavelength of the signal and the diameter of the reflector. At optical frequencies (blue-green light 600,000 GHz or a wavelength of .0005 mm) a 1 meter diameter "perfect" mirror will have a beam width of about .00003 degrees. The same mirror operating at radio frequencies (30 GHz for example with a wavelength of 1 cm) will have a beam width of about 6 degrees. As can be seen, the beam width for the radio telescope is about 200,000 times wider, thus yielding lower resolution observations. At first the solution to this was to build bigger and bigger reflectors, giving narrower beam widths and higher resolutions. By the late 1950's reflectors of 100 metres (300 feet) across were being built. At diameters larger than this, a steerable reflector becomes far too heavy and cumbersome to be effectively used. The big problem is that the surface warps and deforms due to gravity and thus the effectiveness of the reflector is compromised. The one advantage of large reflectors is that with their very large gathering surface area they offer significant signal strength; the down side of this is that they are very expensive to operate, maintain, and build. Even with the large areas, one still must remember that the beam width is still wide compared to optical instruments. A 100 metre diameter radio telescope, operating at 10 cm wavelength, still only has the individual resolving ability of an optical mirror of about 5 mm (less than 1/4 inch). Even with such seemingly myopic resolution, the sheer size of these instruments allows for detection of weak sources billions of light-years away. In a later article I will discuss interferometry, a technique by which multiple radio telescopes can be combined to give the effective resolution of a single telescope many miles across. This process changes the apparently fuzzy world of the radio telescope to one of crystal clarity. Modern radio telescope arrays such as the VLA in New Mexico and the Caltech OVRO millimetre array have resolving abilities far beyond even the Hubble telescope. The temperature of the radio telescope, its reflector, and its receiver are all sources of noise with which the observer must contend. 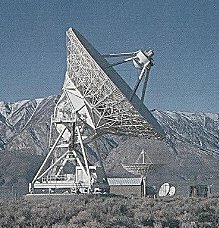 Since everything with a temperature above absolute zero gives off electromagnetic noise in one form or another, and the fact that what a radio telescope 'sees' is essentially electromagnetic noise, the radio telescope needs to be highly selective and reject as much superfluous noise as possible. One method of counteracting noise is to cool the receiving electronics to a temperature just a few degrees above absolute zero. This eliminates thermally generated noise in the electronics. Once this noise has been removed, the amplified signal of interest is then selectively amplified again, converted to more manageable frequency bands, divided into a series of adjacent channels and finally processed to detect the relative power or energy of the source along with frequency and phase detection. Because a radio telescope is so sensitive, other methods of reducing noise are used. One is to reduce reflected and thermal noise from the ground. This is why many radio telescopes have a Cassegrain configuration (a secondary mirror reflects the signals back through a hole in the centre of the main reflector). Since the receiving electronics input focus points to the sky, picking up thermal and reflected noise from the ground is avoided. The final method is to reduce the contributed noise from terrestrial sources. This translated means move the telescope away from the high density cities to some remote location where the local denizens, i.e. rabbits, moss, and life forms found under rocks, do not pollute the radio spectrum. This also usually means placing the telescope in a valley surrounded by mountains so that the terrain blocks a great deal of unwanted radio noise. Add to this the help of the local authorities to declare the surrounding area of the telescope as a 'radio free' zone and you have a reasonably quiet observing site. Finally when all this is combined, the effective noise temperature of an entire radio telescope system can be reduced to only a few tens of degrees above absolute zero, (quite an improvement when considered that typical room temperature is about 300 Kelvin). A signal arriving from a celestial source has now been gathered by a large reflector, concentrated into a small area and fed to a low noise electronic receiver that is isolated from strong external sources, quiet in its own operation and highly selective. The next part of the process is to store the information for subsequent processing. Since many of the radio source signals are so weak, it is often necessary for a telescope to stay fixed on a target for extended lengths of time to insure sufficient information has been gathered. The result of these long 'exposure times' (to borrow a phrase from photography), results in huge amounts of data. In the early days of radio astronomy, information was recorded on paper, which chart recorders spewed out by the mile, and consequently the astronomer had to inspect visually, by the mile. This was an arduous process and sometimes required months to extract the information. In the 1960s magnetic tape was substituted for paper and computers were given the task of correlating the information. Today with inexpensive desktop computers, flash analogue to digital converters, and billion operation per second digital signal processing chips, much of the information obtained can be processed in real time. It is the results of the computations on the raw signal data that carries the ultimate useful information. With faster and faster real time processing, the storage of information has shifted from saving the raw incoming signals to saving the derivatives and ultimately to saving only the specific information. This not only reduces the total storage required (raw signals require magnitudes more storage) but allows for faster retrieval of pertinent information since the data has been prefiltered and formatted. Last, but not least, is the interpretation of the data into a meaningful format. Despite our ability to interpret numbers and form abstract conclusions, we human beings are visually oriented. The information from a radio telescope can indeed be turned into a picture that is easy to understand. However, along with this visual presentation comes volumes of additional information that, when analysed, reveals the secret workings of much of the universe. This information is often intangible to our senses. Properties such as phase, coherence, polarisation and subtle frequency variations cannot be discerned from a simple picture. Additional signal processing and receiving techniques must be used to reveal these characteristics. Often, the presentation of these other qualities will be in a visual or pictorial format, but the colours and intensities will demonstrate properties not normally visible. These 'false colour' images present to the mind visualisations of concepts and properties heretofore unobservable. The radio telescope, while not as basically easy to use as a simple optical instrument, actually reveals much more information to the observer. With its ability to cover a much wider portion of the electromagnetic spectrum, the radio telescope shows much more of the inner workings of the universe. The intrinsic composition of interstellar clouds, the birth of stars, and the properties of stars whose lives have passed, are all observable with the radio telescope where these mysteries are masked to the optical instruments. Now with the combination of highly accurate optical and radio imaging, the cosmos is beginning to become comprehensible. This article is the second in a series on Radio Astronomy, bookmark this page as the following articles will be uploaded shortly. To return to the first article: first radio astronomy article.